C1469. DÉSIRÉ DEFAUW Cond. Brussels Conservatoire S.O. 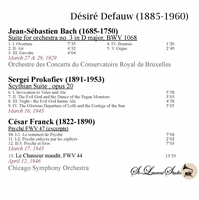 : Orchestral Suite #3 in D (Bach), recorded 1929; DÉSIRÉ DEFAUW Cond. Chicago Orch. 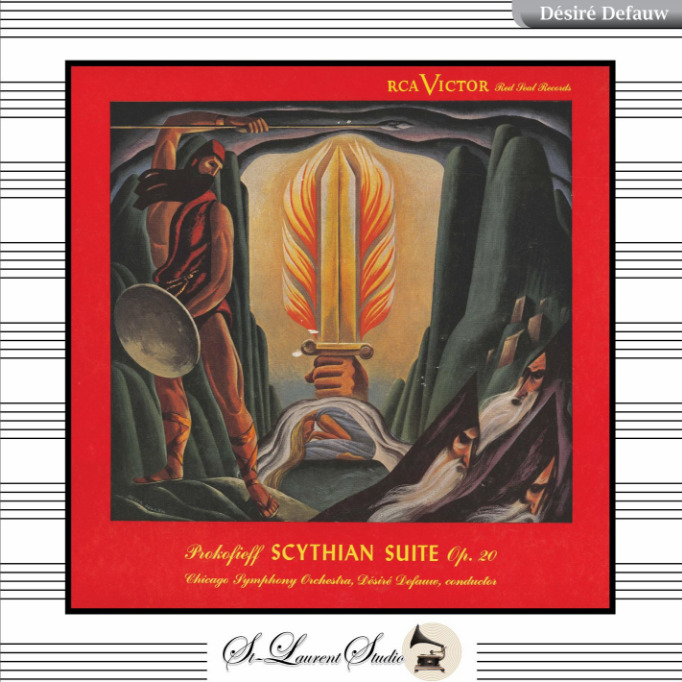 : Scythian Suite (Prokofiev); Psyché - Excerpts - both recorded 1945; Le Chasseur Maudit - recorded 1946 (both Franck). (Canada) St Laurent Studio YSL 78-388. Transfers by Yves St Laurent. “At the age of eight Defauw entered the Ghent Conservatory with the request that he study the violin, declaring: ‘I already know the piano.’ He duly became a student of Johan Smit and was offered a tour of the USA by an impresario when he was only fourteen, but his parents prevented this. A year later he was appointed leader of the orchestra that presented the winter concert season in Ghent, and subsequently began to tour with success as a violin soloist. In 1906 he was selected to lead the New Symphony Orchestra of London, which specialised in contemporary repertoire; and finding himself in London at the outbreak of hostilities in 1914, he established the Allied String Quartet, with Charles Woodhouse (second violin), Lionel Tertis (viola) and Emile Doehard (cello). The quartet toured throughout England, and gave the first performances of several notable works, such as the String Quartet by E.J. Moeran (1923), which was dedicated to Defauw. At the end of the war Defauw returned to Belgium and taught at the Antwerp Conservatory, founding in 1920 the Concerts Defauw which soon acquired a European reputation. During this period he won the praise and admiration of Richard Strauss and Maurice Ravel amongst others, and six years later he was appointed musical director of Belgium’s National Radio Institute, where his responsibilities included conducting a large symphony orchestra created specifically for broadcasting. In addition from 1926 to 1940 he was conductor of the concerts of the Brussels Conservatory, breaking the tradition that these be led by the director of the Conservatory; Defauw also taught conducting at the Conservatory from 1926. He established the Belgian National Orchestra in 1937, acting as its chief conductor during its initial years. In 1939 Defauw was invited to conduct the recently formed NBC Symphony Orchestra in New York: he was to lead three concerts during December of that year in repertoire that included Franck’s Symphony, Schumann’s Symphony #4 and Brahms’ Symphony #3, as well as shorter works by Berlioz, Wagner, Poot and Respighi, amongst others. The following year he became chief conductor of the Montréal Symphony Orchestra, a post which he retained until 1953. He began to conduct other North American orchestras, such as those in Boston and Detroit, and in 1943 he started his four-year tenure as chief conductor of the Chicago Symphony Orchestra. Here he faced hostility from local critics towards both his programmes and his conducting, a fate which also befell his successors in this post, Artur Rodzinski and Rafael Kubelík. 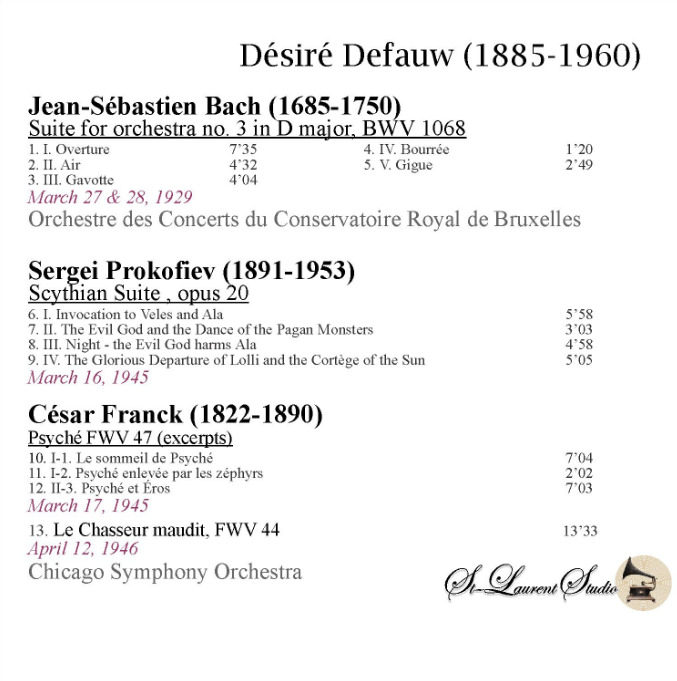 Defauw introduced the music of many contemporary composers to the ‘Windy City’, including Barber, Bloch, Carpenter, Chadwick, Copland, Elgar, Goldmark, Milhaud, Sibelius, Walton, and Warlock. Following the end of World War II he returned to Belgium, but took up permanent residence in America following his appointment as chief conductor of the Gary Symphony Orchestra (now the Northwest Indiana Symphony Orchestra) in 1950. Ill-health forced him to retire from this post after eight years, and he died in Gary in 1960.